Meet Dr. Julie Scott D.C.
Until you’re suffering from back pain upper neck issues, most people do not realize how much they move their neck during the day until they are unable to do so. The degree of flexibility of the neck, coupled with the fact that it has the least amount of muscular stabilization and it has to support and move your 14 – 16 pound head, means that the neck is very susceptible to injury. You can picture your neck and head much like a bowling ball being held on top of a stick by small, thin, elastic bands. It doesn’t take much force to disrupt that delicate balance. The spinal cord runs through a space in the vertebrae to send nerve impulses to every part of the body. Between each pair of cervical vertebrae, the spinal cord sends off large bundles of nerves that run down the arms and to some degree, the upper back. This means that if your arm is hurting, it may actually be a problem in the neck! Symptoms in the arms can include numbness, tingling, cold, aching, and “pins and needles”. These symptoms can be confused with carpal tunnel syndrome, a painful condition in the hands that is often found in people who work at computer keyboards or perform other repetitive motion tasks for extended periods. Problems in the neck can also contribute to headaches, muscle spasms in the shoulders and upper back, ringing in the ears, otitis media (inflammation in the middle ear, often mistaken for an ear infection in children), temporomandibular joint dysfunction (TMJ), restricted range of motion and chronic tightness in the neck and upper back. We associate the neck and upper back together, because most of the muscles that are associated with the neck either attach to, or are located in, the upper back. These muscles include the trapezius, the levator scapulae, the cervical paraspinal muscles and the scalenes, as well as others. Most neck and upper back pain is caused by a combination of factors, including injury, poor posture, chiropractic subluxations, stress, and in some instances, disc problems. By far, the most common injury to the neck is a whiplash injury. Whiplash is caused by a sudden movement of the head, either backward, forward, or sideways, that results in the damage to the supporting muscles, ligaments and other connective tissues in the neck and upper back. Whether from a car accident, sports, or an accident at work, whiplash injuries need to be taken very seriously. Because symptoms of a whiplash injury can take weeks or months to manifest, it is easy to be fooled into thinking that you are not as injured as you really are. Too often people don’t seek treatment following a car accident or sports injury because they don’t feel hurt. Unfortunately, by the time more serious complications develop, some of the damage from the injury may have become permanent. Numerous studies have shown that years after whiplash victims settle their insurance claims, roughly half of them state that they still suffer with symptoms from their injuries. If you have been in a motor vehicle or any other kind of accident, don’t assume that you escaped injury if you are not currently in pain. Get checked out by a good chiropractor. Forward head posture is very common for people who are stooped over their computers all day long. If not taken care of with chiropractic care, subluxations like this can worsen over time. One of the most common causes of neck pain, and sometimes headaches, is poor posture. It’s easy to get into bad posture habits without even realizing it – even an activity as “innocent” as reading in bed can ultimately lead to pain, headaches, and more serious problems. The basic rule is simple: keep your neck in a “neutral” position whenever possible. Don’t bend or hunch your neck forward for long periods. Also, try not to sit in one position for a long time. If you must sit for an extended period, make sure your posture is good: Keep your head in a neutral position, make sure your back is supported, keep your knees slightly lower than your hips, and rest your arms if possible. Subluxations in the neck and upper back area are extremely common due to the high degree of stress associated with holding up your head, coupled with the high degree of instability in the cervical spine. Most subluxations tend to be centered around four areas: the top of the cervical spine where it meets the skull; in the middle of the cervical spine where the mechanical stress from the head is the greatest; in the transition where the cervical and thoracic areas of the spine meet; and in the middle of the thoracic spine where the mechanical stress from the weight of the upper body is greatest. Signs of subluxation include looking in the mirror and seeing your head tilted or one shoulder higher than the other. Often women will notice that their sleeve length is different or that a necklace is hanging off center. If someone looks at you from the side they may notice that your head sits forward from your shoulders. This is known as FHP – forward head posture – and is very common for people who are stooped over their computers all day long. Subluxations are a debt to the body. If they are not taken care of soon after they occur, then they can get much worse over time due to the accumulation of compounding interest. When most people become stressed, they unconsciously contract their muscles. In particular, the muscles in their back. This ‘muscle guarding’ is a survival response designed to guard against injury. In today’s world where we are not exposed to physical danger most of the time, muscle guarding still occurs whenever we become emotionally stressed. 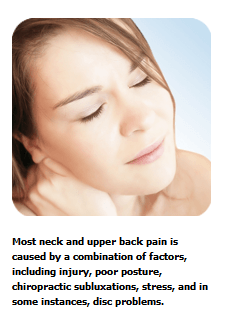 The areas most affected are the muscles of the neck, upper back and low back. For most of us, the particular muscle affected by stress is the trapezius muscle, where daily stress usually leads to chronic tightness and the development of trigger points. The two most effective ways you can reduce the physical effects of stress on your own are to increase your activity level – exercise – and by deep breathing exercises. When you decrease the physical effects of stress, you can substantially reduce the amount of tightness and pain in your upper back and neck. The discs in your cervical spine can herniate or bulge and put pressure on the nerves that exit from the spine through that area. Although cervical discs do not herniate nearly as often as lumbar discs do, they occasionally can herniate, especially when the discs sustain damage from a whiplash injury. Contact us today! If yes, where were they taken and what year? Please click on the correct paperwork needed for your appointment on the left hand of the screen. Please fill out the paperwork completely. We will be calling you shortly to schedule your appointment.